Our BIGGEST SEMINAR OF THE YEAR was a HUGE success! 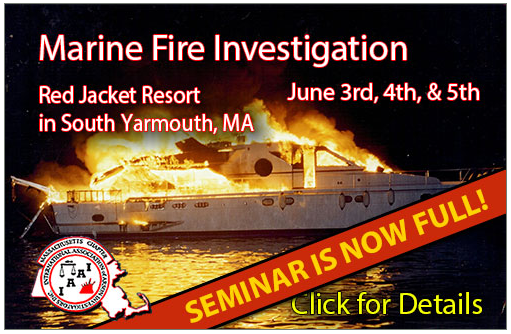 Thanks to all who joined us on Cape Cod for a full 3 day seminar on Marine Fire Investigation! View below to see what you missed! Participants will be attending marine/recreational boat specific fire investigation training and will be participating in two days of hands on training as part of a team approach to fire investigation. The seminar sponsors have staged several boat fires (over ten in all). John Lowe, AMS#875To date only two preceding seminars of this caliber have ever been offered in the country.